Week 7 started off with an absolute dud, as the Seahawks crushed the Niners in San Francisco. But things turned around for the most part come Sunday. In case you missed any of the action, here are the highlights from the week. Chances are you woke up a little late Sunday, so you may have missed the Jaguars/Bills game. Hopefully not all of it, though, because the final quarter was fantastic. No, the play wasn't always top notch, but the end result was highly entertaining. EJ Manuel looked dreadful all first half, and the Jaguars looked like a team that has won more than five games in a season since 2010 (which they haven't actually done). The defense even scored two touchdowns in a seven-second span. Then, in the second half, Manuel suddenly got some confidence, and it culminated in a beautiful 58-yard deep strike to Marcus Easley. Moments later, Corey Graham picked off a really wobbly Blake Bortles pass, and returned it for the go-ahead score. It looked like Jacksonville was once again going to blow a game they should have won. But Bortles, who only finished 13-for-29 passing, looked poised on the final drive, throwing a lob to Allen Hurns, who made one of the better diving catches you'll ever see, giving Jacksonville their first London win, 34-31. And as a bonus, Ohio State's marching band performed during halftime. Because Londoners should also get to enjoy a bunch of people moving in a way that it looks like something else from high above the stadium. The Giants' Dominique Rodgers-Cromartie and Brandon Meriweather had themselves a day. Rodgers-Cromartie recorded a pick-six, Meriweather had two interceptions and a crucial tipped pass on third down, and together they led a defensive charge against the very questionable decision making of Matt Cassel. Dwayne Harris also got to stick it to his former team, as the receiver returned a kickoff 100 yards for a touchdown right after the Cowboys had tied it up. That proved to be the game-winning score. The additional help was needed, as Eli Manning managed only 170 passing yards, and the Cowboys held the ball for more than 38 minutes. Sticking in the NFC East, the Washington Redskins had an historical comeback against the Tampa Bay Buccaneers. After going down 24-0 in the second quarter, it would have been quite understandable for the 'skins to just pack it in. But Kirk Cousins would not be denied, and, as he let the media know after the game, YOU LIKE THAT. Cousins went 33-for-40 for 317 yards and three scores, ran in for another touchdown, and hit Jordan Reed on a slant to cap a crazy comeback in a 31-30 victory over the Bucs, the largest come-from-behind win in Washington history. There are still a ton of questions about this team, but right now, the team is 3-4 and just a game out of first place in the NFC East. For how bad they've looked at times this season, that's not a terrible position to be in. Okay, Miami Dolphins. Turns out all you needed was a new coach. After looking absolutely dreadful through the first four weeks of the season, the Dolphins defense has suddenly woken up, recording nine sacks in the past two weeks. The offense looks amazing, too, with Lamar Miller leading the charge in an absolute demolition of the Texans. Miller finished with 236 total yards and two touchdowns. Ryan Tannehill was pretty fantastic, as well, setting an NFL record for consecutive completions, dating back to last week. He had completed 25 in a row before his final pass of the day was dropped, but even with his modest 18-for-19 stat line, he tossed four touchdowns for 282 yards. The Dolphins only scored 65 points in their first four games, and put up 82 points over their past two. Rookie running backs had themselves a day on Sunday. Jacksonville's T.J. Yeldon and St. Louis's Todd Gurley both found rushing paydirt for the first time this season (Gurley scored twice), and Kansas City's Charcandrick West also punched it in for the first time in his career. He's technically in his second season, but didn't record a rush at all last year, so for all intents and purposes, he's a rookie, as well. Combined, the trio combined for 343 rushing yards All three teams won, too, adding the proverbial cherry on top of a glorious day of running the football. Cam Newton got tapped lightly by a defender after drawing him offsides. The gentle hit caused Newton to get knocked down and lay completely still, like he was unconscious. 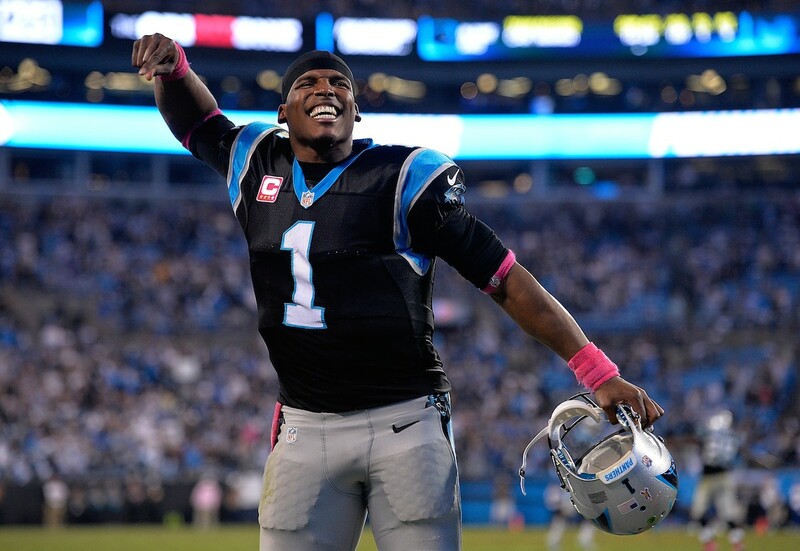 He got back up with a wide smile, probably because he knows his Panthers team is playing tremendous football. Even throwing three interceptions, the Sunday night game was never in doubt, because Carolina's patchwork defense is playing tremendously. Thomas Davis is finally healthy, and hey, he's pretty darn good when he's not standing on the sideline. Luke Kuechly came back and wreaked havoc like normal, Josh Normal just does not let receivers get open, and the other ancient pieces of the secondary – Charles Tillman and Roman Harper – are both playing like they aren't a combined 66 years old. That run game is no joke, either: Jonathan Stewart went wild against the Eagles, and the team as a whole averaged 4.03 before CONTACT on Sunday. That's nuts. Carolina is one victory away from equaling their win total from all of last season. It's safe to say the Panthers are for real. Sam Bradford threw 46 passes Sunday night. His receivers dropped seven of them, including several crucial ones. The worst offender was probably Miles Austin on a fourth-down play that essentially ended the game, but just about every receiver dropped a catchable ball. Sam Bradford isn't playing well enough for the team to be making mistakes like that, and what was billed as one of the most potent offenses in the NFL simply hasn't been that, ranking 16th in total offensive yards and 17th in points per game. Houston has now played two games where they've been down by more than 40 without scoring a single point themselves. On Sunday, that happened before halftime. Sure, the Texans, monsters of garbage time production, made the final score look semi-respectable, but this is getting ridiculous. The Cleveland Browns had been looking really competitive of late. Realistically, they probably should have beaten both the Chargers and Broncos, and they had an impressive come-from-behind victory against the Ravens. Granted, the St. Louis defense is a tough behemoth to crack, but even the boldest of guessers wouldn't have predicted that Cleveland would lose four fumbles against the Rams. Josh McCown also ran into a wall, so it was really just a poor day all around. At this point, it can be reasonably argued that the San Diego Chargers have forgotten how to play defense. They allowed the Raiders to score on their first SEVEN possessions, and have now allowed at least 24 points in all of their seven games this year. They're just the third team in the past 25 years to pull off that impressive(ly bad) feat. Jimmy Wilson got eaten alive on Sunday; it seemed like every big score had something to do with him not being in the right spot on defense. It's hard to argue with the Patriots' results, since, you know, they're undefeated and just picked up a solid divisional win over a very good Jets team. But when Tom Brady leads the team in rushing, you could say the run game could use a little work. Brady finished with 15 yards on four carries. James White and LeGarrette Blount combined for five rushes for one yard, as the Patriots threw six times as many passes as they had carries. Just a little more balance would be nice, guys. Matt Stafford has played the Vikings twice this season, and has been hit a whopping 21 times. 13 of them came in the Lions' 28-19 loss Sunday. This is the first time in 64 years the Giants had an interception and kick return for a touchdown in the same regular season game. The Redskins had the first successful onside kick so far this season, and it came during a time when an onside kick was totally unexpected. Maybe that's the trick! Oakland's Amari Cooper is the first rookie with three 100-yard receiving games in his team's first six games since Mike Ditka did it way back in 1961. Houston faced a fourth-and-36 at one point in their loss to the Dolphins, the longest distance anyone has had to achieve to attain a first down this season. As you may have guessed, they wisely chose to punt. Oh, boy. Two weeks in a row with 1-4 records, and if not for the Cardinals clinching an interception late in the Monday Night game, this could have been a goose egg. I guess I could take consolation in the fact two of my picks did actually win, they just didn't cover. But…I'm not taking consolation in that. Let's move on to Week 8. As always, the home team is in CAPS. This is more not trusting the Rams than it is believing in San Francisco. As favorites, St. Louis is just 1-2 this year, their win coming against a weak Browns team last week. Do I believe the Niners win this game? Absolutely not. But hopefully they contain Todd Gurley and put enough points on the board to at least cover. Just a heads up, we're about to go HEAVY on road favorites. This could be disastrous. But I feel most comfortable with the Cardinals, who are 5-2 ATS as road favorites since Bruce Arians took over in 2013. They were shaky in their win over Baltimore, but as the Browns may be trotting Johnny Manziel out there, I think this is a perfectly coverable spread. Both of these teams are coming off their byes, and I think Denver's luck finally runs out against an offense that's actually, you know, good. Yes, the Raiders looked mighty impressive in snatching a 37-3 lead against the Chargers. But the Jets' defense likely won't allow touchdowns off short screen passes like San Diego seemed to on every other play. It's a matter of the offense scoring enough points to keep up, and I think they can. The Colts' only wins have come against their fellow AFC South scrubs, and they've yet to put a fully competitive game together. There's always the possibility for a garbage time touchdown here, but after looking quite solid on Sunday night, Carolina's defense should shine again in another primetime effort.